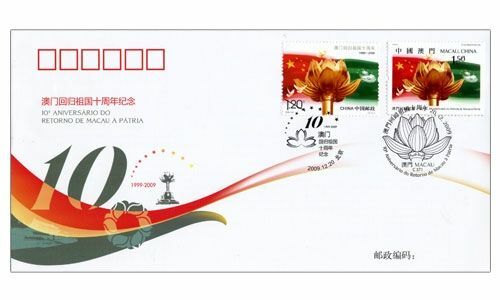 In celebration of the 10th Anniversary of the Reunification of Macao with the Motherland on 20th December, 2009, China Post and Macao Post are jointly issue the stamp theme “10th Anniversary of the Reunification of Macao with the Motherland”, to share the joy of this anniversary by all across our country. 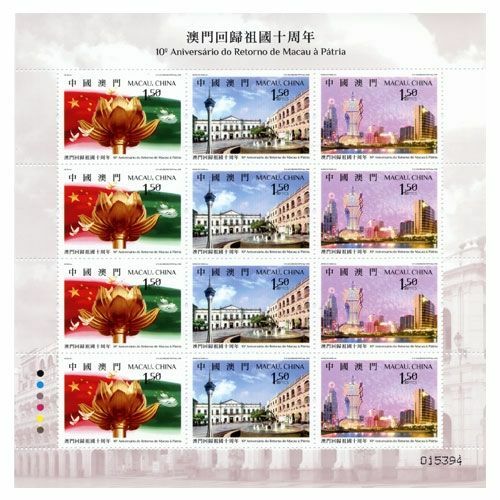 The souvenir sheet jointly issued by China Post and Macao Post contains 3 stamps of each postal administration. 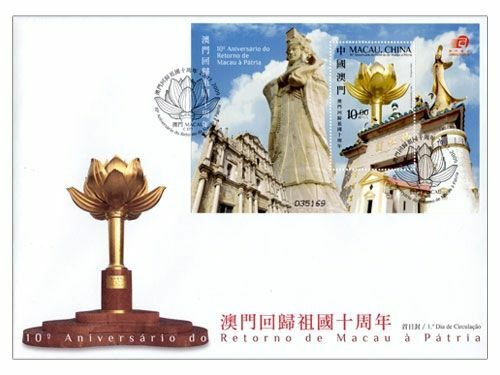 The first stamp of the two postal administrations uses the same design, the national flag and the regional flag of Macao SAR waving side by side in the background, the large sculpture of "Lotus Flower in Full Bloom" presented to Macao SAR as a gift from the Central Government as its main image, it symbolizes the everlasting prosperity of Macao with the support from our Motherland. 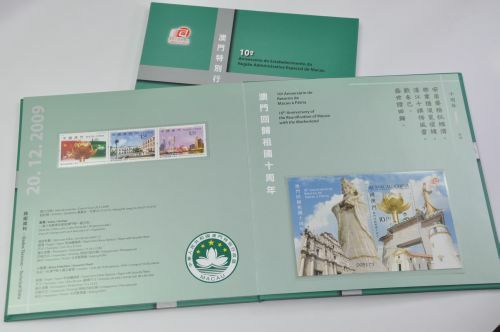 Among the total printing quantity of stamps, 870,000 sets of stamps are integrated into souvenir sheets jointly issued by China Post and Macao Post, which have been transformed as presentation pack. 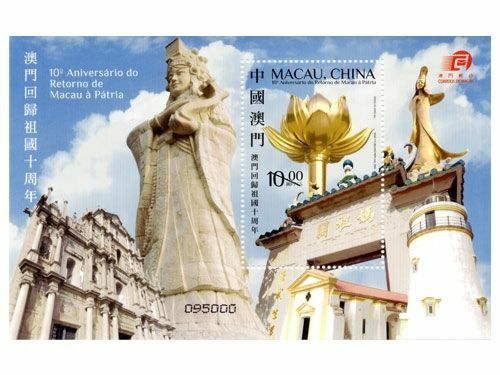 Among the total printing quantity of 870,000 packs, the total of 180,000 to be sold in Macao are numbered with the code “M” representing Macao, this pack is priced at 20.00 patacas each. 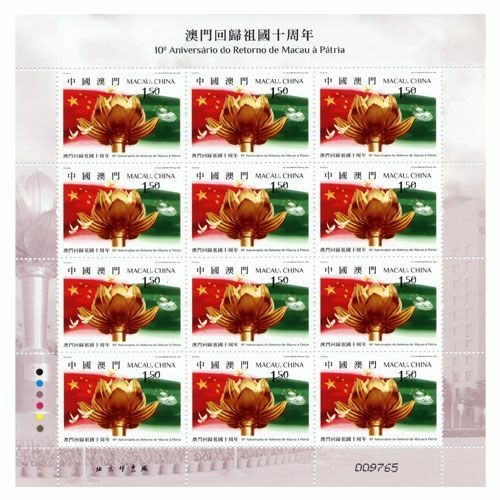 Macao Post and China National Philatelic Corporation firstly joint issue a commemorative envelope with the printing quantity of 37,000 envelopes, it affixed with a MOP1.50 stamp and a RMB1.20 stamp of the same issue and cancelled with the postmarks of Macao and China respectively, the total of 10,000 to be sold in Macao is priced at 7.00 patacas each. 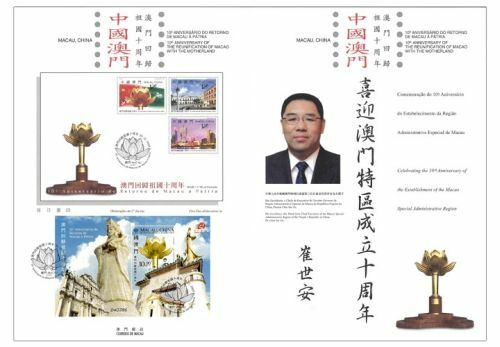 480,000 sets of stamps are printed as 120,000 sheetlets, among the total sheetlets, 20,000 sheetlets are overprinted with the words “Philatelic Exhibition of China’s Diplomacy on the Celebration of Macao’s Return to the Motherland” and priced at 20.00 patacas each; and the rest of 150,000 stamps are printed on each sheet of 12 stamps. Except the first stamp designed by Mrs. 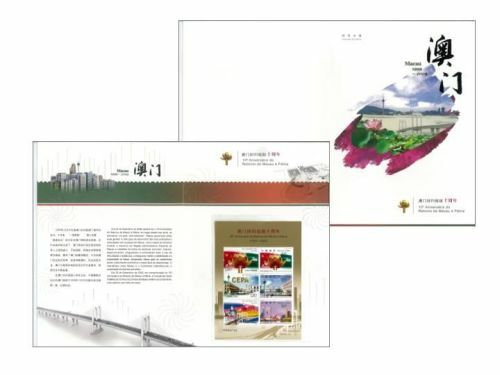 He Jie, the whole set of stamp for this issue is designed by Mr. Wong Ho Sang, and the text for the information brochure is written by Macao Post. This is the twelfth issue in 2009. 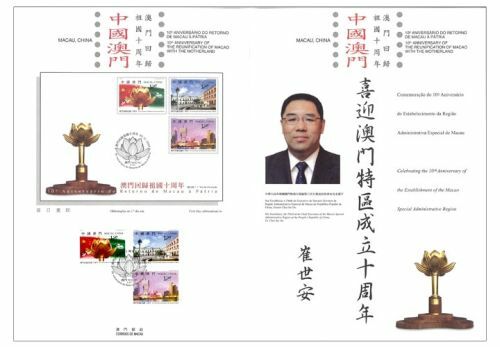 The issued stamps are as “Bicentenary of the Birth of Louis Braille” on 04/01/2009; “Lunar Year of the Ox” on 08/01/2009; “Opening of Kun Iam Treasury” on 20/02/2009; “Traditional Instruments II” on 01/03/2009; “Mainland Scenery III” on 08/04/2009; “120th Anniversary of the International Labour Day” on 01/05/2009; “Seng Yu – Idioms III” on 01/06/2009; “60th Anniversary of the Founding of the People’s Republic of China” on 01/10/2009 and “Artwork from the Culture Mix of East and West” on 09/10/2009 and “120th Anniversary of the Founding of the Pui Ching Middle School” on 29/11/2009; and the coming issues are “Macao Science Center” and “10th Anniversary of the Reunification of Macao with the Motherland”. 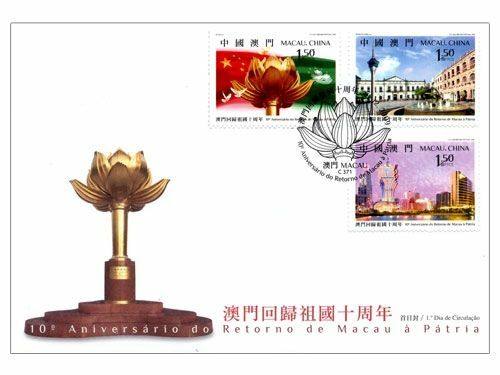 In celebration of the 10th Anniversary of the Reunification of Macao with the Motherland, Macao Post will issue a thematic pack under the theme “10th Anniversary of the Establishment of the Macao Special Administrative Region” on that date. 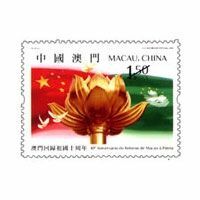 This pack comprises 4 series of stamps and souvenir sheets with the significance of the Establishment of the Macao SAR, which included the Establishment of the Macao SAR, the 1st, the 5th and the 10th Anniversary. 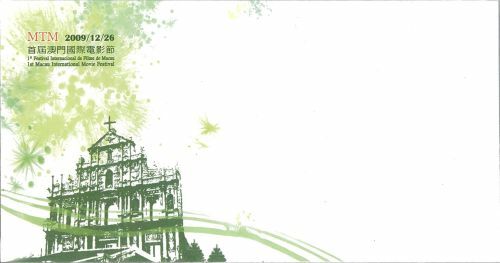 The representative green colour of the Macao SAR has been used as the main colour on the hard cover, together with a silver cross symbolizes the theme of the 10th anniversary. The side of the pages is applied with hot foil stamping with silver, highlighting its simplicity and elegance. The inner pages are printed with 4 songs of Yuan Dynasty “yuanqu” written by Mr. Lao Wah, describing the changes over the ten years. 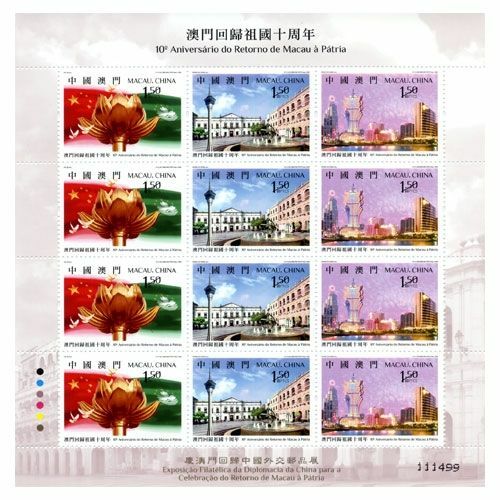 This pack will be available for sale at the Philatelic Shop of Macao Post Headquarters, “Rua do Campo” Post Office, Maritime Ferry Terminal Post Office, Airport Post Office, and the Communications Museum starting from 20th December, 2009. This pack is priced at MOP150.00, and it is an excellent product, either as a collectable or as an elegant gift. 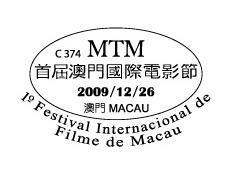 To commemorate the 1st Macau International Movie Festival, Macao Post announced that a Temporary Post Counter will be set up at the Macao Forum, at 17H00 to 20H00 on 26th December 2009 providing the commemorative cancellation service for the “1st Macau International Movie Festival”. 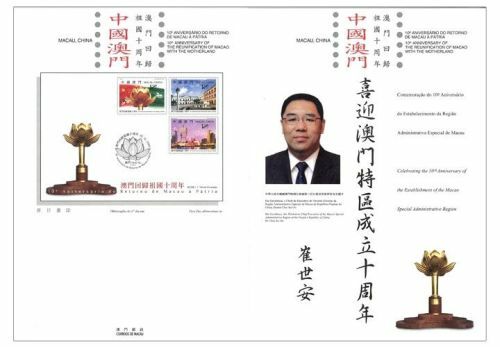 A commemorative envelope will be issued, blank envelope priced at MOP2.00, and the envelope with stamp priced at MOP10.00, together with the various philatelic products available for sale during the above activity. 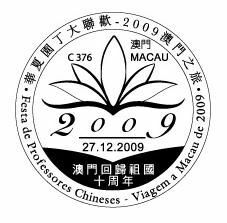 To commemorate the Festival of Chinese Teachers – A Trip to Macao 2009, Macao Post announced that a Temporary Post Counter will be set up at the Macau Fisherman's Wharf Convention and Exhibition centre, at 12H30 to 19H00 on 27th December 2009 providing the commemorative cancellation service for the “Festival of Chinese Teachers – A Trip to Macao 2009”.